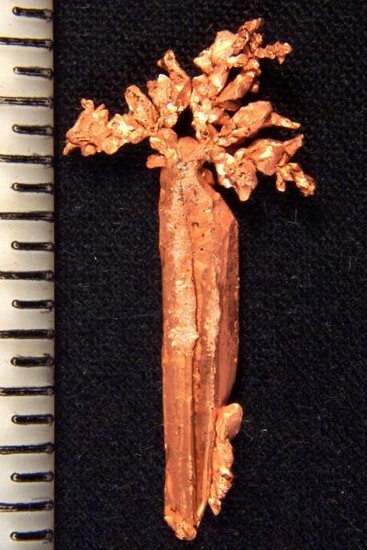 This natural copper crystal specimen is shaped like a carrot. You can distinctly see the carrot and the carrot top. I have had to select through a lot of collections and specimens to get so many specimens that have distinct shapes. 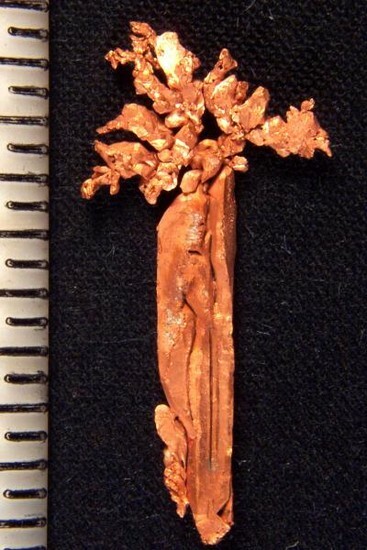 It is 1.1" (28 mm) long and comes in a plastic gem jar for display. The weight is 16.6 Grains (1.07 Gram). It comes from Dzhezkazgan in Karaganda Oblast, Khazakhstan. I believe that I have the largest selection of gold, copper and platinum nuggets in unique shapes. A collectors dream.